Hemming’s first novel expands on a short story, “The Minor Wars,” that appeared in her debut story collection (House of Thieves, 2005) about a self-consciously privileged Hawaiian family in crisis. The great-grandson of a Hawaiian princess, lawyer Matt King is under pressure to decide to whom his family should sell its vast land holdings when he learns that his wife Joanie, comatose since a boat-racing accident, is definitely going to die once the hospital removes life support. A beautiful model with a penchant for hard drinking and fast boats, Joanie has always chafed at her quiet domestic life with Matt, a workaholic trying to live off his career rather than his inheritance. Matt has left the day-to-day rearing of their daughters Scottie and Alex to Joanie and now feels inept as he reaches out to the girls. Scottie is a classic ten-year-old, that painful mix of pseudo-sophistication and clueless innocence. Sent by Joannie to boarding school for typical rich-kid bad behavior (cocaine), Alex comes home at the cusp of maturity, still furious with her parents but self-aware. Pressed, she tells Matt that she caught Joanie having an affair. Matt now must deal with his sense of betrayal as well as his and his daughters’ grief. Unlikely help comes from Alex’s maybe-boyfriend Sid, whose laid-back wisdom has been hard-earned. Matt takes the girls and Sid in search of Joanie’s lover to let him know her condition—and he soon realizes that the man did not love Joanie and perhaps used her to sway Matt’s decision about the land sale. Hemmings pulls off a remarkable feat in making the Kings’ sense of loss all the more wrenching for being directed at a woman who was neither a good wife nor a good mother. No one does trouble in paradise quite like Kaui Hart Hemmings. 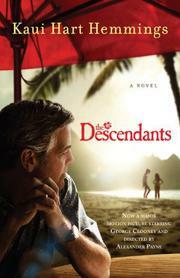 The Descendants (2007), her daring novel, is a pitch-perfect mix of dark matter and deep laughs—the story of a prominent family grappling with death, infidelity and one another on the verdant island of Kauai.